Lot:9448 Fr. 251. 1899 $2 Silver Certificate. PMG About Uncirculated 53. Inverted Back Error. Fr. 251. 1899 $2 Silver Certificate. PMG About Uncirculated 53. 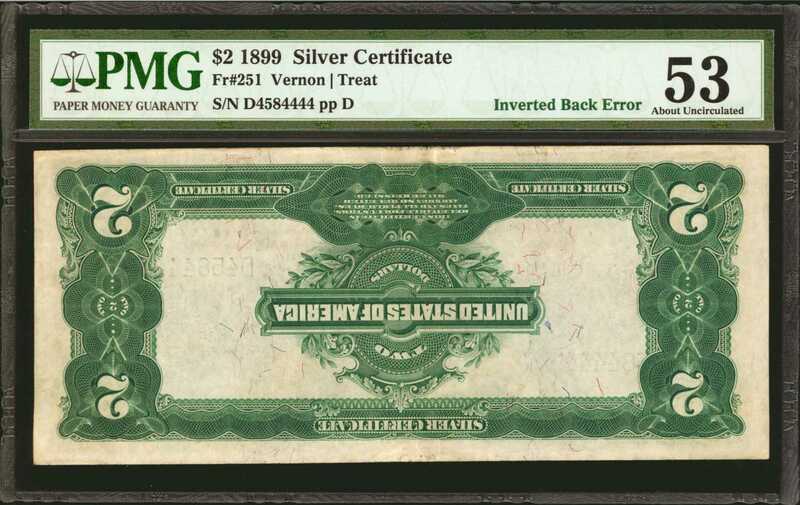 Inverted Back Error.An impressive large-size error note which was fed into the machinery for the second printing backwards, resulting in improper orientation of face to back. This one hardly circulated and is most likely the finest known for this cataloging number. A scarce error-with just about any on large-size issues-and in strong demand.